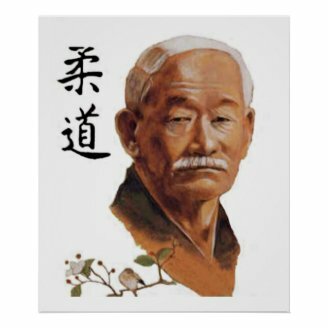 Martial arts owes a lot to Dr Jigoro Kano, the founder of modern day Judo. The history of judo can be traced back to Dr Kano's early years during the the late 1800's. The history of Judo is actually quite easy to document, probably due to Dr Jigoro Kano being born into quite a well off family where he was encouraged to progress with his martial arts. His life story is an interesting one, showing how someone who was only 5'2" tall and weighed just 90 lbs was to become the foremost exponent of his new martial art known as "the gentle way' which, when translated into English is what we now call Judo. No, never studied martial arts. Although Judo is now a world wide sport and studied by 100's of thousands of people around the globe, the history of Judo as a martial art had very humble beginnings. It's founder, Jigoro Kano was born in a small island off Japan call Okinawa, but after the death of his mother Kano's father moved the family to Tokyo where, as a young man he was sent to boarding school. It was during this time he searched for a martial arts teacher who would give him lessons in the 'martial art' of the day, which was primarily Jiu-Jitsu. His small size made him the perfect target for the bullies at the boarding school and thus he decided by learning a martial art he could at least protect himself. This was frowned upon by Kano's father who wanted him to pursue a more modern sport of the day and not the old fashion arts. Even though Kano's father was, himself, a high level martial artist in various other disciplines. Kano ignored his fathers words and became a student where they mainly taught a Jiu-Jitsu style of fighting and also using the various other styles of known at that time. Although learning very fast and gaining a high standard, Kano was not satisfied with the methods and teachings of the day which consisted of mainly watching the masters and then practicing by actually fighting. A kind of 'keep trying until you know what you are doing' principle. These methods of teaching students was not to Kano's liking and, being so small, found himself constantly being defeated by the bigger, heavier students. This is where Kano found his own methods of martial arts by trying unusual and different techniques on these bigger opponents. Soon he developed many moves that were both unfamiliar and successful on these bigger opponents. His methods would use the opponents body weight, position and momentum and when yielding to this, he found he would gain the advantage on these opponent's. This led to Kano quickly defeating the masters in Randori. *Randori is free practice, in the early days Randori was a close as you could get to actual competition. This form of practice enables student to compete against each other improve their skills. The success of Kano's new techniques enabled him to quickly become a high ranking student, so much so, that he gained his licence to teach at the age of only 21. In short "the student had become the master" - no mean feat for someone so young. 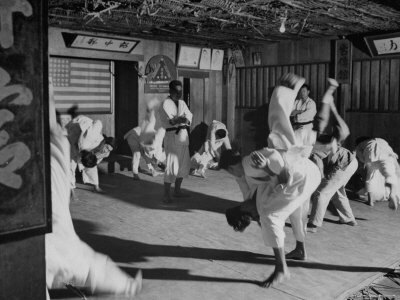 photographic print of students practicing. It was during this time that many of the old masters died and Kano took it upon himself to continue the art and develop what he had begun into a fully fledged martial art, taking all the good points of many martial arts and incorporate them in his, already large syllabus. Kano had taken the 'grunt' out of the old methods and developed a more gentle, yet far more effective method of defeating an opponent. He named his new martial art Judo, which when translated means "the Gentle Way". Exactly the principles and techniques that had led Kano to defeat his bigger opponents. The new methods of martial art were soon recognised by other students and Kano's ranks of new students began to swell to the point where he officially opened his very first Kodakan Dojo in Tokyo 1882. A translation of the Kodakan is "a place for the study of the way." From here on it's just history really with Kano moving to bigger and bigger premisses around the early 1900's and finally to, what is recognised, as the official home of Judo in 1958 to a dojo with over 500 mats available for students. Quite an achievement for a humble 5'2", 90lb man to develop such a formidable martial art and lead it to become the number one martial art in the world. Dr Jigoro Kano's statue outside the Kodakan, Tokyo. Fellow keyboard warriors - Now is the time to start your training - So if you have enjoyed reading this article then please show a little martial arts love and give it a "Thumbs Up" and add you comments. Fascinating! It explains why judo is so suitable for women - like Kano, we too are small and don't have much weight! An interesting subject! And a very well written article! Cheers! Stellar. if I want to know about Judo, this is where I will go. I'm not an experienced Wizzler, but this all looks good to me, and very interesting. Steve, I just joined wizzley myself so I am probably not considered "experienced" with it all quite yet! I can tell you that so far it has been a positive experience and I have enjoyed reading the works of others, yours included! 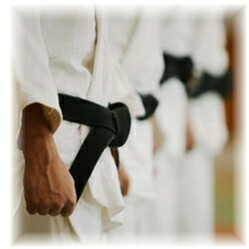 I am not a participant in Martial Arts but but brother started with wrestling, Jiu-Jitsu....competing heavily in both. He is now involved in MMA. I guess in a round about way, I have been very involved in the sport. Keep writing! Sound good to me! Hi Steve, and welcome to Wizzley! I enjoyed your article. :) I did some karate back in the day, and I used to watch martial arts movies at some point. If my back were in better shape, I'd do some martial arts these days too. But I'm mostly sticking to Pilates. Still, I think martial arts are a great way to work the body and sharpen reflexes. A Golden Hamster can be easy to care for if you go about it in the right way. Golden Hamsters are the same breed as the Teddy Bear Hamster and also the Syrian Hamster. What are the best Hamster Cages for sale that will give the very best Hamster Habitat and the best Hamster Environment for your little pet.